It’s nice when new photos of recently completed work shows up. This is a timber framed cabana I designed in collaboration with Mark Nelson Architecture while I was an employee at Cascade Joinery. It is in Medina on the shore of Lake Washington and is used as a guest house for the owners whose main house is on the bluff above. The interesting thing about it is that it is only accessible by water or a small tram going up and down the bluff. Great site! Affordable net zero home in Bellingham? Is it possible to build an affordable net -zero home in Bellingham? That was the question first posed when Kulshan Community Land Trust (KCLT) and Cascade Joinery teamed up back in 2009 to build KCLT’s 100th permanently affordable home in Whatcom County. What exactly is a net -zero home? Simply put it is a home designed to produce enough energy on site to satisfy its annual energy consumption requirements. The program given to me as architect was to design a 2-3 bedroom home under 1200 square feet and built for no more than $160,000. Achieving net-zero energy use within this framework was a significant challenge requiring careful analysis of each and every decision in order to balance energy efficiency and affordability. Passive Design measures are low cost solutions that take advantage of the energy the sun freely gives us. This involves a careful site study and sometimes computer modeling to determine the proper building orientation, optimal amount, size, and location of glazing, thermal mass and shading devices all with the goal of maximizing and storing solar heat gain, minimizing heat loss, and preventing overheating. Passive design also means designing smaller homes that use less energy from the start. Energy Efficient Construction will get you closer to net zero energy use than any other thing you can do. A highly insulated, tightly sealed envelope with maximum efficiency appliances and lighting is critical in order to reduce consumption. In the Madrona street house advanced framing, high insulation values, and careful detailing to minimize infiltration are critical components of the design. Additionally infiltration rates were verified via blower door tests at various stages during construction in order to measure performance while corrections could still be made. Homeowner Conservation is the cheapest form of energy. As simple as closing the refrigerator door and turning out the lights. Education and providing the tools to monitor real time energy usage is the first step toward achieving net-zero energy usage. On Site Renewable Energy is the final step toward net-zero energy use after passive design, energy efficient construction, and conservation measures have been exhausted. Renewable energy technology is still the most expensive piece of the puzzle thereforereducing overall consumption is critical in order to reduce the size of whatever renewable energy system you choose, be it wind or solar power. In the KCLT home the solar panels were provided by an anonymous donor. Here in the Pacific Northwest producing solar energy is made possible by net-metering. Net-metering means that the surplus of power that your photovoltaic system will produce during the long summer days is sold back to the power company and those credits are applied to you during the winter months when your system will produce less and you may have to purchase power. So will this house achieve net-zero? The energy modeling software used to design this home tells us that we may be very close. It will take at least a year of occupancy to find out for sure. Fortunately the homeowners are educated about the goal and committed to pursuing it. The most advanced energy efficient materials, systems, and technologies have not been applied to this home because affordability was an equally important goal. That is what makes this home so compelling. It is the attempt to balance these two competing goals that will move our community closer to the dream of permanently affordable homes that produce as much energy as the consume, provide healthy indoor environments and use the planets resources responsibly. One year ago this week I hung up my shingle as Greg Robinson Architect, moved into my new office, sat down and wondered what next? I’m happy to report, one year later, that this first year has exceeded all expectations and I have found enough work to, as one of my former colleagues used to say, “keep me out of bars and the arms of loose women”. Kidding aside, it is nice to be working with real clients on real projects. Some of the highlights of this past year include substantial progress on the last home I designed as an employee of Cascade Joinery in Kauai, construction of a shelter for a library in Crawfordville Indiana, a beautiful outdoor room/garden trellis for a former client in Whatcom County, and converting an abandoned second floor in an unreinforced masonry storefront building into office space for a local non-profit organization in Sedro Woolley, WA. Look for more about these projects in future blogs. 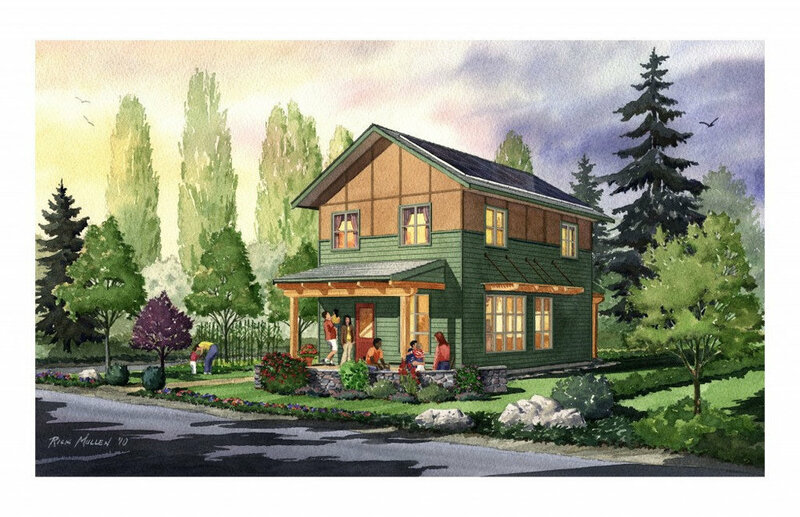 New work that I look forward to being built this next year includes new homes in Edmonds, WA, Sedro Woolley, WA and Wasilla AK. , an outdoor kitchen and playhouse for a former client on Shaw Island, and additions to existing homes on Lummi Island, Blakely Island, and in Bellingham WA. I am grateful to all of you who have encouraged, supported, and helped me this first year. Although I find myself challenged to navigate the world of social media, and keep in touch when I get busy, I greatly value my relationships, look forward to making new ones, and continuing to “Collaborate to create” for years to come. In March permits were issued and construction began on a house I started designing exactly one year ago, in March 2011, for a couple building on a 4.5 acre lot outside of Princeville, Kauai. The house consists of 3 separate pods, each with their own roof structure, connected by breezeways. The size and location of each pod was determined by a number of factors including topography, prevailing weather patterns and views, and Japanese principles of design regarding proper orientation of individual rooms on site. The result is a cross cultural blend of ideas tailored to fit a unique site. In this regard the house reflects the broader culture of the Hawaiian Islands as well. As you may deduce from the photographs one of the challenges of building in this particular location is dealing with the heavy rains. As the trenches for the footings were being dug the island received 15 inches of rain in just about 4 hours! Roads were closed, bridges washed out, and any open trench quickly filled. Not to worry, Hawaiians are used to dealing with this type of weather. When the rain stopped large pumps were brought on site to clean out the trenches so the pour could proceed. Stay tuned for further updates and progress reports as construction proceeds on this unique home. Welcome to GRA and my first blog post. By now you realize that after 15 years as principal architect at Cascade Joinery I have launched my own firm. Yes it’s great to be self-employed and exciting to be building a new future but I do not deny that I will miss my day-to-day interaction with Cascade Joinery. The past 15 years have provided me with wonderful memories. These include the rocking chair that was given to me and my wife when my son was born, the seaplane rides to remote islands off the coast of British Columbia, the trips to Hawaii, the lunches together in the yard swapping stories, the vicious games of basketball and ping pong, the daily trash talk that went back and forth between myself, the only architect, and the builders and craftsmen I was surrounded by, and also the weddings, funerals, and Christmas parties we all attended together. Cascade Joinery was for me, an environment that fostered creativity, passion, and excellence. I learned much there and plan to carry that same culture into my own practice. So why start my practice during the great recession? I think it’s just a matter of evolution. At some point in every architect’s career they will have to make a choice between continuing to work as a staff architect for someone else or going out on their own. Starting a practice requires a certain degree of experience, confidence, capital, and desire. Once you have developed all of these then the question becomes, why not? So thank you Cascade Joinery and hello GRA. I look forward to continuing to collaborate with clients, builders, and craftsmen to create meaningful architecture of real and lasting value.